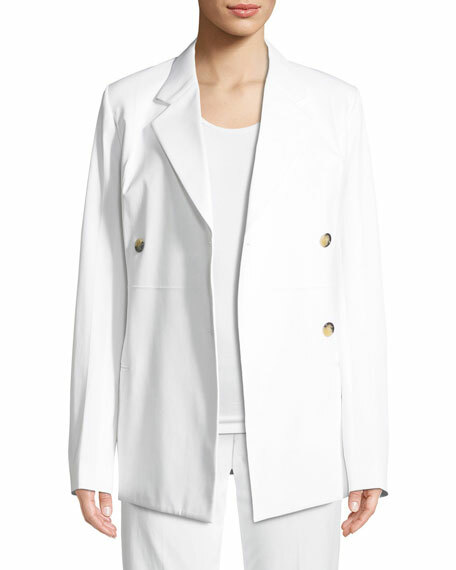 Helmut Lang double-breasted cotton blazer. Berek leopard-print stretch knit blazer with shimmery metallic coating. Notched collar; two-button front. Long sleeves; button cuffs. Flap pockets at waist. Tailored fit. Straight hem hits just below seat. Cotton/spandex. Hand wash cold. Imported. Model's measurements: Height 5'10"/177cm, bust 33"/84cm, waist 25.6"/65.2cm, hips 35.8"/91cm, dress size US 2-4/FR 34-36. Brunello Cucinelli double-breasted blazer in crushed velvet. Notched lapels; brass buttons. Long sleeves. Side flap pockets. Relaxed fit. Center back vent. Cotton/viscose/spandex. Lining, acrylic/silk. Made in Italy. Model's measurements: Height 5'10"/177cm, bust 31"/79cm, waist 24"/61cm, hips 34"/86cm, dress size US 0/2. Diane von Furstenberg "Tommy" velvet blazer in floral-print. Shawl collar; single-button front. Long sleeves. Chest welt pocket. Front flap pockets. Diane von Furstenberg "Tommy" velvet blazer in floral-print. Shawl collar; single-button front. Long sleeves. Chest welt pocket. Front flap pockets. Tailored fit. Hip length. Viscose/nylon. Polyester/spandex lining. Imported. Model's measurements: Height 5'10"/177cm, bust 31"/79cm, waist 24"/61cm, hips 34"/86cm, dress size US 2. 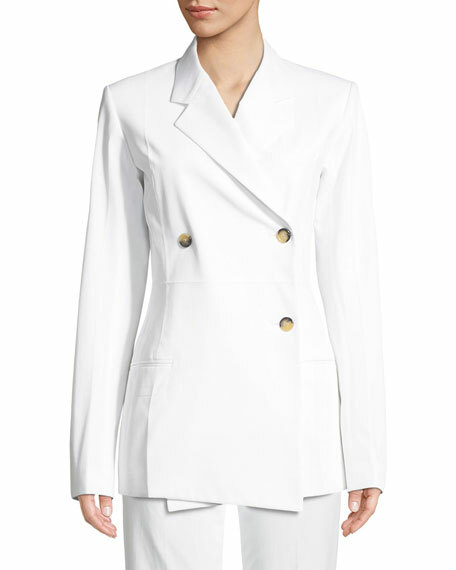 Gabriela Hearst "Angela" blazer in cashmere plaid suiting. 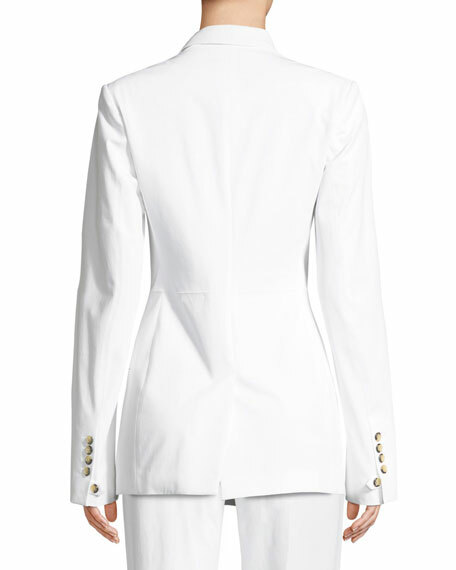 Peak lapels; double-breasted front. Long sleeves; button cuffs. Side flap pockets. Tailored fit. Double-vented back hem. Made in Italy. Model's measurements: Height 5'10.5"/179cm, bust 32"/82cm, waist 23.5"/60cm, hips 34.5"/88cm, dress size US 2.